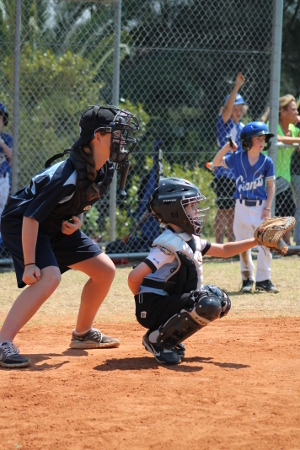 The Sharks 8/1’s travelled out to Blacktown to participate in the Blue Sox U9’s T-ball Cup tournament last Sunday. At the coaches meeting I sat as a nervous coach wondering how our team could compete against Association and combined teams in a higher age group on a larger diamond, only to notice outside on the diamond of the Olympic Stadium the 8/1’s had made themselves at home manning the mound...running the bases. We went into the first game against a similar aged team Quaker’s Hill which we took easily 12-4. Fears aside the next round brought us a combined 9s team fat with hard hitting boisterous players and coaches. They simply overwhelmed us 12-4 though the score doesn’t seem as close as the game was with most of the St Mary’s runs coming off some timely long balls...and overwhelming ‘enthusiasm’. The final prelim was against another combined 9’s team from Kellyville who played us hard and down to the wire with the Sharks capping the game with a squeeze play at the plate for an out. 12-9 win and on to the semis. We drew another 9’s combined team in East Hills who we traded blows with until the game was timed out with us slightly across the wire at 8-4. We then ran into a brick wall against the Castle Hills 9’s team with the one run we scored against an offensive and defensive white wash can be seen as an achievement. 12-1 loss. They will win the cup next weekend. But a 4th place finish for an under 8’s club side against under 9’s competition? Unreal. I am so very proud of this team. So many rival coaches and officials praised the effort of our ‘little guys’. I am even prouder to have a team full of dedicated and good natured parents and siblings to help out on long days like these. I cannot name names of players, parents, coaches, officials…it wouldn’t be fair because everyone did their bit to make this an incredible success for our team and our club. I will make an exception for Kate O’Halloran’s umpiring debut. Once in you couldn’t pry her away. Good onya Kate!